Making Over My Dining Room and How to Paint Dentil Moulding… the EASY way! We have completely overhauled our dining room and are so excited to show you the amazing trick we found to paint our dentil moulding, quickly and easily! But first, let’s take a look at our starting point. These doors sold me this house. They are the entryway into our dining room and I fell in love with them immediately. They magically blocked out the peach trim, pink carpet and flowery wall paper and called out my name. Okay, not really, but I did swoon quite a bit over these French Doors. This is where we started, before we moved in. It was built in the 80s and stayed in the 80s, but I saw good bones and knew I could make this my own. Look at that wallpaper and cream trim! That’s oil paint y’all and that dentil moulding is what made me choose to cover it all with oil. The prep work for latex over oil is a multi-step process. Those little grooves would take weeks to prep let alone paint, so we opted for oil and I’m so glad we did. I love my chandelier that came with this house. Beautiful vintage antiqued brass with crystals! First we had to strip the wallpaper. I used a steamer I had on hand to heat up the paste. We found a second layer underneath! It only partially covered the room so our guess is the original owner changed their mind. This second layer was much more difficult to remove and ended up damaging the drywall paper, which needed repair. We had to skim coat the walls and lightly sand them before we could prime and paint. 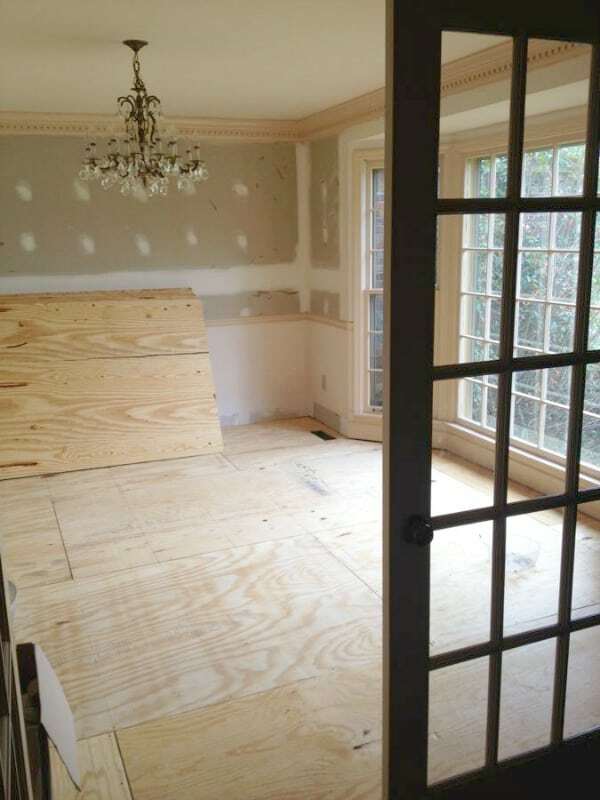 Next we worked on Hardwood Floors and opening our wall into the kitchen with a Pass Through. Click the photos for links on these tutorials! Once it all was removed, we were able to start on the dentil moulding. 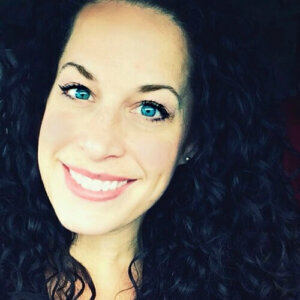 I was really stressing about this until I found this genius product that has forever changed my life! These little sprayers saved my life!! Trying to get my paint brush into each nook and cranny of the dentil moulding was painstakingly slow. I was instantly discouraged once it dawned on me that not only did our Dining Room have the dentil moulding, but our Den did as well! I even looked at painters forums for tips and read things like, “Just turn on some music and take your time.” “Unless you have a commercial sprayer, you’re in for a long haul!” That didn’t make me hopeful and I didn’t have a commercial sprayer. We stumbled upon this product at our recent trip to Lowe’s and snatched it up right away. I swear the product was spotlighted with angels singing from heaven! We followed the instructions on how to mix the paint for oil using mineral spirits and started spraying. I did NOT take photos of the during, because working with oil is VERY messy and gets on everything. So let me tell you exactly what we did. We chose to paint over the icky peach with Sherwin Williams Pure White SW 7005. First, expect a little overspray from working so high if your moulding is attached like ours. We thoroughly covered the floors and used a piece of cardboard as a shield to protect any spot we didn’t want the overspray to work. What is overspray? It’s the teeny, tiny little dots that go where you DON’T want your paint to land. We were mainly protecting our ceiling, which we were painting flat Latex. Latex and Oil are sworn enemies and don’t mingle well at parties, so we wanted to make sure they were kept separated. Boy! You can really see the peach trim against that primer! Back to the moulding… This sprayer has a small opening and is different from a traditional paint sprayer. We made a mistake at first, so please learn from ours. When we painted the walls and ceiling, we could really see the shy spots from the first coat on the dentil moulding. That peach is just peeking through! The photo above shows our attempt at spraying it straight on instead of angled. As you can see, the notches did not get full coverage, so we were sure to angle the Preval from this point on. Our objective was to spray 2 coats on the ‘teeth’ of the moulding and then follow up with the two coats with the brush. First we sprayed from the left and followed up brushing the first coat of oil on the remaining trim. Allowed it to dry overnight, and then sprayed from the right and applied the 2nd coat with the brush. We used this same technique in our Den and it made the painting process take hours instead of days with the help of the Preval sprayer! Clean with TSP and allow to dry. Clean once again to remove traces of TSP and dry overnight. That would have taken us weeks! 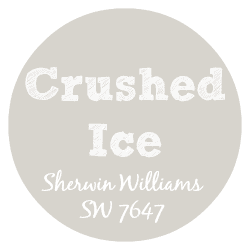 Our walls are painted with Sherwin Williams Crushed Ice SW7647. We painted the lower wainscoting with the same Sherwin Williams Pure White. Here is how our Dining Room looked for a while, but be sure to check back in a few days as I will be sharing the Vintage Hutch we received as well as how we turned this Dining Table into our dream Farmhouse Table! Wow, what a fabulous tool! That moulding would be very hard to paint without it. Looks lovely! Thanks for sharing with SYC. Thanks Jann! I can't wait to share the big reveal of how it all turned out! Gorgeous! I imagine this technique would be useful for all kinds of tight spots. The before and after shots are amazing! Thank you Meredith – glad my tips could help! Thank you so much!! And that second layer of wallpaper was crazy indeed!! !